The 10 Best Mountain Biking Trails in Utah! Mountain biking is a serious lifestyle in Utah. And with so many trail options for avid mountain bikers, the state is often considered a mountain biking mecca. Here are ten of Utah’s best mountain biking trails to feed your addiction. With its red slick rock and one-of-a-kind geography, the Moab area is home to some world-class mountain biking. The Porcupine Rim Trail is one of its most popular trails, but this one is not for beginners. In fact, his 15.6-mile trail requires advanced technical skills and a high level of fitness. Technically located in Big Cottonwood Canyon, the Wasatch Crest Trail neighbors Alta, Brighton, and Solitude ski resorts. And as you might expect, the trail is full of 360-degree views that feature beautiful rolling green mountains and all the wildlife that accompanies such a rich landscape. The trail is at a high altitude, which means it typically isn’t available to ride until July. The White Rim Trail is Southern Utah’s quintessential mountain biking experience. Although it is a 103-mile loop, the trail itself isn’t particularly difficult. The trail’s length on its own, however, requires a decent level of fitness. The trail winds through the spectacular Canyonlands National Park and features adjoining campsites every few miles. That said, you must obtain a permit from the National Park Service to ride the trail and/or to reserve a spot at one of the campsites. One of Utah’s best known slick rock trails, Gooseberry Mesa Trail runs adjacent to Zion National Park, offering awesome views of the park and its neighboring geography. And although certain parts of the trail don’t require too much experience, you wouldn’t want to take a newbie. 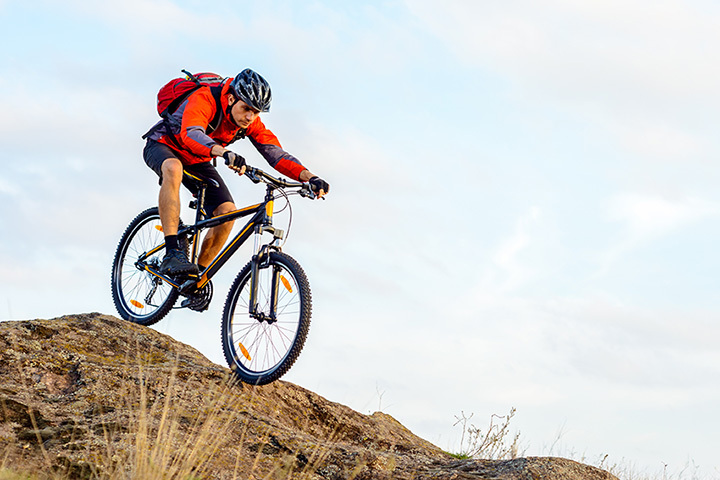 Some stretches of the trail are not only strenuous, but require advanced technical mountain biking skill. Spanning from the Northern Utah border to Santaquin in South Utah County, the Bonneville Shoreline Trail is easily one of Utah’s longest mountain biking trails, but also one of its most popular. This probably has something to do with the trail’s accessibility. After all, for many Utah residents, the trail is only a five-minute drive (or walk) from their backyards. Starting on Brian Head Peak, Dark Hollow Trail is a scenic downhill trail that starts at an elevation of 11,300 feet. The trail takes you through forests of spruce and aspen and gives you views of Cedar Breaks’ bright pink cliffs. A collection of intertwining trails above Park City, the Park City Mountain Resort Trails account for miles and miles of alpine mountain trails that can be accessed by chairlifts or shuttles. None of the trails are specifically downhill trails, which means these trails really lend themselves to exploration and spontaneity. Suited for beginner and experienced bikers alike, this lower-altitude ride isn’t too long but does require a decent level of fitness. On the upper mountain, the trail features wild rose as well as choke cherry, elderberry, and currant trees. This is a great way to prepare for the descent, which is exciting but not too challenging. A 10.3-mile loop dotted with wildflowers, the Sardine Peak Loop is shaded, made of relatively simple switchbacks, and gives you a 360-degree view of Ogden Canyon. And what’s better? The trail isn’t very crowded, given that it is only a few years old.